Finn Delaney & John Tierney. The National Roads Authority, Dublin, 2011. x+225pp & CDr. ISBN 978-0-9564180-4-3. £22.26 (via Amazon) or €25 (via Wordwell Books). 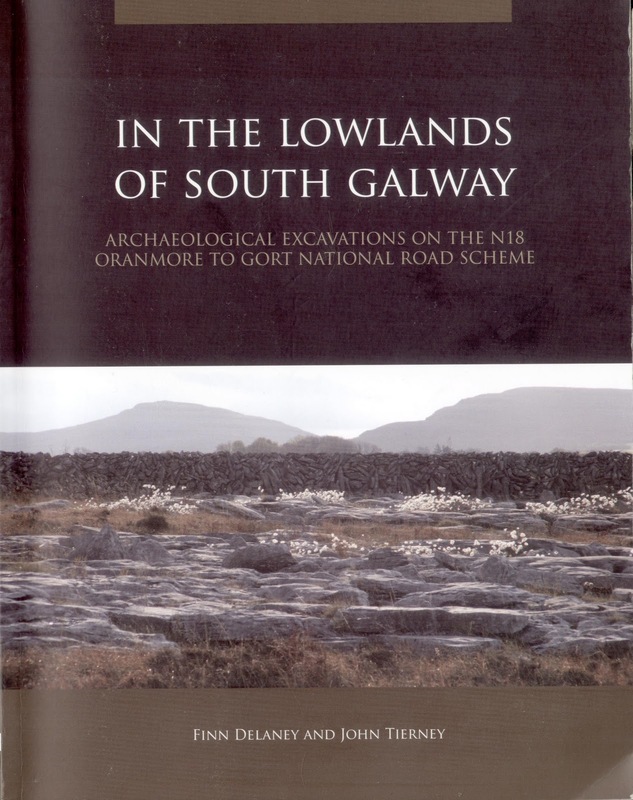 In The Lowlands of South Galway is the seventh in the National Roads Authority Scheme Monographs series. In my review of the previous volume (Of Troughs and Tuyères), I stated that since its inception in 2007, the series has established itself as a benchmark in high quality academic publishing. This volume is a fine addition to the series and, if anything, sets the bar higher for future contributions. In the Introduction, Finn Delaney, Jerry O’Sullivan and Maurizio Toscano describe their study area as ‘a self-contained sort of place with a strongly defined character that derives in part from the landscape and in part from its history.’ In preparing a review such as this, I do strive to be as even-handed and professional as possible, but this, the first line of the introduction, was a ‘you had me at hello’ moment. Although I’ve not lived in the area for over twenty years, this is where I grew up, where a large part of my family still live (and are buried), and where I first developed my interest in archaeology. Even simply listing the major families of the area - the Gregorys, Martyns, Persses, Shaw-Taylors, O’Shaughnessys (from whom I am descended), and the O’Heynes - is deeply redolent to me of my background, my family, and my past. To say that I am biased in favour of this book may be an overstatement, but I have been excited about the archaeology of this area since I was a child and I have looked forward to reading this book since I first heard that it was coming to print. Perhaps I am a little biased, but at least I’m honest about it! 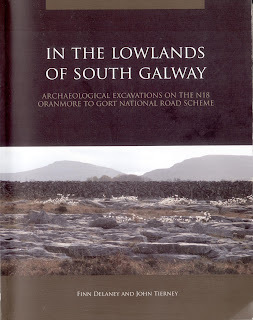 Back to the introduction: the authors describe the project to construct approximately 28km of dual carriageway from near Oranmore to the outskirts of Gort. They provide succinct introductions to the landscape and settlement history - from the Neolithic to the 19th century. This is followed a very brief synopsis of the 23 archaeological excavations carried out along the route by Eachtra Archaeological Projects. The chapter concludes with a description of the Geographical Information System (GIS) employed on the project, the Eachtra Archaeological Projects Office Database (EAPOD). While this topic may only be fascinating to a relatively small number of professional archaeological practitioners, its direct relevance for readers of this book is that it is the means by which the large number of detailed site plans and wider distribution maps were produced, along with being the repository of the data by which the detailed spatial analyses were undertaken. In Chapter 2, Burnt Mounds in the Bronze Age Landscape (Finn Delaney and John Tierney with Maurizio Toscano) the results of some 12 excavations are presented. The dating of these sites in keeping with other sites of their type, with radiocarbon determinations stretching across the entire period from Early to Late Bronze Age. As the authors point out, the significance of this group lies in the paucity of excavated examples in county Galway - only 18 had been excavated in the county prior to 2006. While they have become somewhat ubiquitous in other parts of Ireland, the addition of twelve published examples to the known corpus from Galway is definitely welcomed. The chapter continues with a detailed spatial analysis of the sites, examining their distribution in relation to other recorded prehistoric monuments. Interestingly, concentrations of ring barrows centred on Derrydonnell North and the well-known Dunkellin barrow group appear to be adjacent, but not co-terminus with defined groups of burnt mounds. As the authors note the subjective nature of such comparisons of distribution maps, they set out to use more objective (or at least, less humanly-subjective) methods available through various techniques of spatial analysis. Unsurprisingly, there is a confirmation of previously noted trends, such as location of sites near water. Analyses of density and clustering indicate that the burnt mounds should not be seen as isolated sites, but as part of an integrated Bronze Age landscape. Further analyses of the morphology and taphonomy of the excavated sites follow. In all cases, the stone type used on these sites was the locally available limestone. While it has been suggested (Grogan 2007) that the use of limestone would provide calcium hydroxide, it is argued that the amount created would be insufficient to poison the food. 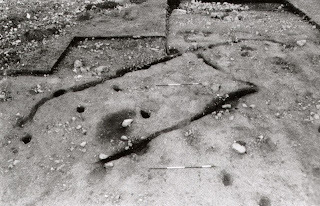 One of the excavated troughs, at Ballyglass West, showed evidence for having been provided with a stone lining, though it may have been further augmented with wooden elements and clay daub. Other sites revealed stakeholes in the bases of the troughs, interpreted as evidence for wattle linings. While animal bone is infrequently recovered from burnt mound sites, it is incorrect to imagine that they are wholly devoid of it (Tourunen 2008). Pig teeth were recovered from Ballyglass West; single cattle teeth were recovered from both Caherweelder 2 and 3; while a cow horn and a portion of shed deer antler were recovered at Moyveela 2. The poorly preserved site at Coldwood produced both cattle and sheep bones. Similarly, only a few lithics were recovered, all of which are regarded as chance or residual finds. A possible Early Mesolithic chert blade was recovered at Ballyglass West, while at Caherweelder 6 a Late Mesolithic chert blade was recovered. Neolithic flakes were also recovered from sites at Coldwood, Caherweelder 5, and Ballinillaun 1. The Archaeology of Early Medieval Uí Fiachrach Aidhne (Finn Delaney with Maurizio Toscano) examines the excavated remains of levelled cashel sites at Derrydonnell More and Drumharsna South, along with a ‘cemetery settlement’ site at Owenbristy. The chapter first sets the scene by examining the physical influences of the local landscape on site choice of site location. This is followed by a thorough review of the ringforts and cashels of the area, firmly placing them within their physical and political landscapes. Further geospatial analyses examine clustering of sites to identify physical concentrations of sites, along with the identification of trends in altitude, aspect etc. One result of particular interest is the observation that there is a clear relationship between the positioning of ringforts and cashels in relationship to early ecclesiastical sites. The church sites were seen to be deliberately positioned at the peripheries of the main enclosure groupings, while actively avoiding both isolation and the centres of enclosure clusters. While the authors stress the tentative nature of these results and the need for further study, I find them fascinating, not least as they appear to be in contrast to results from my own work on the ringforts of the Loop Head Peninsula, Co. Clare. Here I examined similar aspects of location, morphology and relationship to early ecclesiastical church sites to those undertaken for the south Galway area (Chapple 2003, 2011). My conclusions were that the church establishments were initially pioneering foundations in a relatively unpopulous landscape. This allowed them to amass comparatively significant estates prior to the later development of more secular development. However, in the light of recent research carried out by the Early Medieval Archaeology Project, as part of the INSTAR programme, the traditional dichotomy of ‘monks in monasteries and everyone else in raths’ must be reassessed. Chapter 4, Rural Settlement in the Early Modern Landscape (John Tierney with Maurizio Toscano), deals with the excavation of five early modern sites on the road scheme. At Moyveela 3 a pre-Famine clachan was investigated, while two cottages were identified at Roevehagh 2. At Lavally a tenant farmstead, inhabited until the early 20th century, was excavated, along with two community wells at Ballyglass West and Caherweelder 4. In particular, the reconstruction drawing of the Moyveela 3 clachan truly brings the site to life. To my mind, it demonstrates all that is best about thoughtful artistic interpretations and their ability to capture the informed imagination of the reader. Chapter 5 represents the ‘main event’ of this volume with its description of the excavation and analysis of the ‘cemetery settlement’ at Owenbristy (Owenbristy - Cashel and Cemetery). While short summaries of the findings at this intriguing site have been available for a time (Delaney et al. 2009; Lehane et al. 2010), this represents the definitive account of the site. The original excavation director, John Lehane, provides a comprehensive summary of the excavation. This includes pre-enclosure activity during the Beaker period, through the main cashel and cemetery phases, and into the later burials of the 13th to 15th centuries. A brief review of the recovered artefacts is also appended and include short entries on lithics, quern stones, blue glass beads, bone pins, metal artefacts, along with modern pottery etc. Of the metal artefacts, the majority were of iron, with small numbers of copper alloy, brass and bronze also being represented. A terminal of a bronze brooch decorated with simple, cast interlace was recovered. Of particular significance was the recovery of a plain iron neck ring from around the neck of one of the burials. The skeleton (Sk70) was later radiocarbon dated to the mid 6th to mid 7th centuries cal AD (1457±36 BP, UB-11248). Margaret McCarthy provides an analysis of the animal bone from the site, demonstrating that the majority of the species represented were of cattle, sheep/goat, and pig, but that horse, dog and deer were also represented. While some discrepancies are noted in comparison to other ‘cemetery settlement’ sites, the dominance of cattle is an emerging constant. This is contrasted to contemporary ringfort assemblages that lack the same high percentages of cattle remains. McCarthy suggests that, in the developing paradigm, where ‘cemetery settlements’ are perceived as foci of local power and wealth, the assemblages represent meat provisioning for the social elite who visited these sites at times of burial. Jonny Geber presents the results of an analysis of the human remains from Owenbristy. Of the 75 burials dated to the Early Christian period, a number of conclusions may be drawn. In common with other sites and assemblages, the highest risk areas for mortality were during youth and young adulthood, and after 40 years of age. The mean stature of the male population was 1.73m (5ft 8in), while the mean female stature was 1.60m (5ft 3in). Various dental and skeletal pathologies were identified. Caries was only present in adults, though young adult and older adult females had the highest occurrences, which may be related to gender differences in diet. Calculus (tartar) was present on the teeth of all adults, and approximately half of the non-adult population. A number of degenerative joint diseases, including vertebral osteophytosis, intervertebral osteochondrosis, and osteoarthritis were also identified. Isotope analysis of five Early Christian skeletons suggested that the population relied on a terrestrial diet. High δ15N values among infants and young children are taken to indicate the practice of breastfeeding. Comparison of these values across the age groups suggests that children were regularly weaned around their second or between their second and third year. While this is an uncommonly late age in contemporary Western European society, it is still the usual practice in developing countries and is approximately the length promoted by the World Health Organisation. Of the Early Christian population, 22% of the adolescents, 10% of the adult females, and 31% of the adult males suffered violent deaths - all of which are much higher rates than other contemporary assemblages. One of the adolescents (13 to 15 years of age) had been repeatedly stabbed and eventually (after two unsuccessful blows) decapitated. Two of the females had been decapitated, one with at least six further facial stab wounds. In this latter case, the evidence suggests that she attempted to fight off her attacker while she lay on the ground, frantically moving her head from side to side. One of the adult males was decapitated, though this appeared to have taken at least three blows. A number of other adult males displayed evidence of having received wounds from bladed weapons, such as swords. One individual received 127 independent cut wounds as his corpse was decapitated and quartered. Elizabeth O’Brien examines the context and content of the cemetery, drawing on Geber’s work on the Osteology of the population. She concludes that the Owenbristy site gives us an overview into life and death in Early Christian Ireland, especially in the period from the 7th to the 9th centuries. In the final portion of this chapter (Owenbristy: towards an understanding) Finn Delaney with Zachary Silke examine the historical background of the site and ponder the exact form and function of this ‘cemetery settlement’. As an aside, I would draw the reader’s attention to the excellent reconstruction drawing of Owenbristy. Both of these reconstruction drawings are by Dan Tietzsch-Tyler who, incidentally, provided the beautiful reconstruction drawings for Ann Lynch’s monograph Tintern Abbey, Co. Wexford: Cistercians and Colcloughs. Excavations 1982-2007 (see my review: here). Chapter 6 provides Excavation Summaries of all the sites investigated as part of this project. While the entries are brief, they are comprehensive with clear and concise information given on every feature excavated. The sites are comprehensively illustrated with post-excavation plans, along with on-site and finds photography. Personally, I would have liked to have seen some representative section drawings or profiles through some features - especially the burnt mound troughs - but that’s probably just me! Chapter 7 details the Artefacts and Plant Remains. Sara Camplese and Finn Delaney provide a catalogue of selected prehistoric and medieval finds, expanding on the brief notices given in the body of the text. Farina Sternke discusses the significance of the lithic artefacts. Among the Mesolithic and Neolithic pieces noted earlier, there are brief comments on lignite bracelet fragments, hones and a spindle whorl from Owenbristy, along with a possible naturally-formed crucible from Drumharsna South. Mary Dillon and John Tierney discuss the charred plant remains. At the burnt mounds, only the site at Ballyglass West produced charred plant remains. Here a single cereal grain and a small number of knotweed seeds were found. Similarly, the three major Early Christian sites at Owenbristy, Derrydonnell More, and Drumharsna South produced relatively few charred plant remains. Small amounts of wheat, barley, and oat grains were recovered, along with a weed seed and a sloe stone. At the burnt mound sites the recovered charcoal was mostly hazel (35%), with Pomoideae type (16%), oak (14%), and ash (13%) also being represented. At the Early Christian sites charcoal was generally sparse. At Derrydonnell More the most abundant charcoal types were pine and ash, while willow was most commonly recovered at Owenbristy. Appendix 1 lists some 79 radiocarbon determinations commissioned for the project, while Appendix 2 provides a catalogue of the burials from Owenbristy. The volume also comes with a CDr containing all of the original ‘grey literature’ site reports. While I have not taken the opportunity to investigate all of them, a select perusal indicates that they contain the full texts of all the appropriate specialist reports etc. In my review of the Of Troughs and Tuyères volume, I expressed my ambivalence with the CDr format and how it may be more easily superseded by emerging technology than we may care to admit, leaving us with valuable, but unreadable, data. I still see no clear way forward where these large volumes of data may be easily and cost-effectively presented and still remain ‘future proofed’ against the tide of changing technology. I would also like to give special notice to the quality of the photography in the volume. Every facet of the photography is superb, from the on-site images to the finds photography. However, it is the additional photographs of nearby sites, outside of the road-take, but still of interest and importance, that I found particularly arresting. Their inclusion demonstrates a wider commitment to not just communicating the archaeological discoveries themselves, but to placing them within their wider landscape and cultural contexts. Obviously, this volume is a must for any student of Early Christian settlement and burial, along with anyone interested in the burnt mound phenomenon, not to mention our early modern past. It is also a must-have volume for anyone with an interest in this ‘self-contained sort of place’. Beyond that it, together with the other volumes in the NRA monograph series, forms one of the jigsaw pieces in a new archaeology of Ireland - perhaps one of the few lasting legacies of the Celtic tiger experience. Perhaps it is too much hyperbole to suggest that when the ghost estates have been demolished and the road network is again considered insufficient for the needs of the population, that the knowledge and scholarship gained from these excavations will continue to inform, educate and inspire. Then again, maybe it’s not! Chapple, R. M. 2003 ‘Ringfort morphology and distribution on the Loop Head peninsula, Co. Clare’ North Munster Antiquarian Journal 43, 53-74. Chapple, R. M. 2011 A statistical analysis of ringfort distribution and morphology on the Loop Head Peninsula, Co. Clare. Belfast. Delaney, F., Lehane, J., Keefe, K. & O'Sullivan, G. 2009 ‘Medieval life and death by the 'broken river'’ Seanda 4, 36-39. Grogan, E. 2007 ‘General evaluation and assessment of the excavation results 1: fulachta fiadh and related sites’ in Grogan, E., O’Donnell, L. & Johnston, P. The Bronze Age Landscapes of the Pipeline to the West. Dublin. Lehane, J., Muñiz Perez, M., O'Sullivan, J. & Wilkins, B. 2010 ‘Three cemetery-settlement excavations in county Galway at Carrowkeel, Treanbaun and Owenbristy’ in Corlett, C. & Potterton, M. (eds.) Death and burial in Early Medieval Ireland in the light of recent archaeological excavations. Dublin, 139-156. Tourunen, A. 2007 ‘No bones about it: burnt mounds along the N9/N10’ Seanda 2, 70-71. If you’re planning to do any shopping through Amazon.co.uk, please go via the portal below. It costs you nothing, but it does generate a little bit of advertising revenue for this site – please help! Eoin Grogan & Charles Mount (eds.). 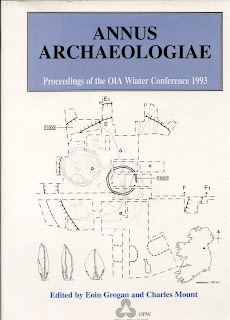 The Organiastion of Irish Archaeologists, Dublin, 1995. 72pp. 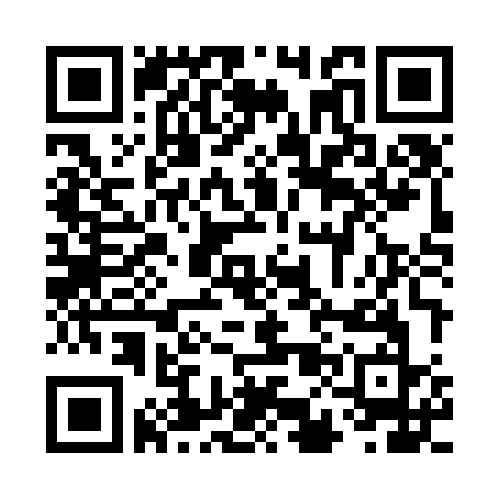 ISBN 0-9524666-0-0. €7.99 + P&P from Dr. Charles Mount (see contact details at the end of this piece). Since I started this blog in August 2011, and realised that there was some interest in archaeological book reviews, I have pretty much kept to the latest offerings available to the profession. Thus far I have published seven reviews of books, all of which were released either in 2010 or 2011. This review is a little different as the book I have chosen was published some 17 years ago, in 1995, and presents papers from a conference held in UCD two years previously. Even the sponsoring body of the conference, The Organisation of Irish Archaeologists is now long defunct. To explain my choice, and its significance, I need to go back a few years. Around 2007 I received a specialist report on a collection of flint from a site I had excavated. In the bibliography for the report was a reference to Annus Archaeologiae. As I had never come across this particular volume, and was intrigued by the Latinate name, I contacted the flint expert and asked for a little more information. I don't remember his exact words, but they were along the lines of: 'it's pretty hard to get, but if you can find it do buy it - it is really excellent'. There should be legislation against saying that kind of thing to a borderline-OCD bibliophile! Over the next few years I tried tracking the book down, but to no avail. Eventually I found a copy for sale on AbeBooks for about £30 from a book seller in Sweden. I placed my order, but when the proprietor went looking for the item it was missing - presumed lost or sold. My money was refunded and my hopes of owning a copy appeared to have stalled. Some time later Charles Mount and I got to talking on Facebook. After having chatted back and forth for a while I decided to mention my quest for the ‘lost’ book that he had co-edited. I explained that I presumed that it was long out of print and unavailable, but that I’d gladly pay for a photo-copied reproduction. I can only say that I was gobsmacked when I received an email back informing me that not only did he have a spare copy, and that one was already in the post to me, but that he still had quite a number of the of the books still in his possession. Having now had the opportunity to read through the six papers presented here, I can only conclude that it is a shame that this book is not better known by the archaeological community. In the first paper the late Elizabeth Anderson and Gina Johnson present ‘Irish Later Mesolithic Flint Technology: Further Developments’. They report on a project of refitting and morphological analysis on lithics from the excavation of a Later Mesolithic industrial site at Bay Farm I, Carnlough, Co. Antrim (Woodman & Johnson 1996). They compare the material to that recovered from Newferry, Co. Antrim (Woodman 1977) and conclude that the method of ‘Larnian’ core reduction, along with its related implements, were only one of a number of strategies and tool types current throughout the period. In particular, they see the ‘Larnian’ core as associated solely with the final stages of the Later Mesolithic. They also argue that the production of these core types, along with broader blades and flakes at the end of the Mesolithic may well be indicative of a changing approach to stone working. They conclude that the Bay Farm site is atypical of the Irish Later Mesolithic and that the core types used in the majority of other sites have yet to be identified. The late Prof. D. A. A. Simpson presents a paper on ‘The Neolithic Settlement Site at Ballygalley, Co. Antrim’. Outside of the brief interim reports in the Excavations Bulletin, there is relatively little published on this important site. To the best of my knowledge, there are only four publications of any substance on the site. In 1990 there was a brief piece in Archaeology Ireland (Simpson 1990) and an interim report in the Ulster Journal of Archaeology (Simpson, Conway & Moore 1990). Simpson (1996) also published a piece on the houses at Ballygally and a few years later a more general piece on the pitchstone from the site (Simpson & Meighan 1999). While the whole field of Neolithic house studies has progressed markedly since this paper was presented, it is still a valuable addition to the available corpus. If a practical example as to how much the field has moved on was wanted, it could hardly be better expressed than in Figure 3.5 in this paper where plans of all known Irish Neolithic houses could be comfortably accommodated on a single page: Ballygalley, Ballyglass, Tankardstown I & II, Ballynagilly, Newtown, and Knowth. Indeed, in the absence of a final publication on the site, such smaller pieces are all the more valuable. Eoin Halpin presented a paper on ‘Excavations at Newtown, Co. Meath’. The site was a partially-surviving rectangular Neolithic house, ancillary feature/out house, and various cut features containing contemporary artefacts. A Bronze Age pit burial with an associated pottery vessel and several postholes arranged in an arc were also recovered and investigated. Again, I may be wrong, but in so far as I am aware, there is precious little available in the published record about this site. There is a remarkably brief notice of its initial discovery (and that of Ballygalley, too) in Archaeology Ireland (Anon. 1991) along with an entry in the Excavations Bulletin for 1991. The following year Gowen and Halpin (1992) published a brief summary of the site, also in Archaeology Ireland. While the report in Annus Archaeologiae is nowhere near as in-depth as one would like for a final report on this interesting and important site, it is much more detailed than any of the other available materials. For this reason alone, Annus Archaeologiae deserves a place on the bookshelves of any student of Irish archaeology. Conor Newman presented interim findings from his excavations at ‘Raffin Fort, Co. Meath: Neolithic and Bronze Age Activity'. Similar to the situation of Halpin’s excavation of Newtown, Co. Meath, there is a limited amount of published material available for this important site. To the best of my knowledge, there is only this publication, the interim reports from the Excavations Bulletin, and a published paper from a conference in Italy (Newman, Dillon, Molloy & O’Connell 2008). Until I began work on this review, I was unaware of the latter paper, but the title ‘Environment and ritual in a Late Iron Age context: an example from Raffin, Co. Meath, Ireland’ suggests that it is unlikely to be a large-scale exposition of the site data. This leaves us with eleven pages in Annus Archaeologiae as (currently) the single most detailed discussion of this incredibly important site. I have little doubt that, in the long run, this site will be the focus of a more in-depth and formal publication. Until that time, we have this near-lost gem to help fill in the blanks. The final paper in the collection is Aonghus Moloney’s presentation of the ‘Irish Archaeological Wetland Unit: 1992 Survey and Excavations’. The paper presents short, but informative, reports on the Blackwater survey, Co. Offally, and a number of excavations. The latter include a togher at Annaghcorrib, Co. Galway; a gravel road at Bloomhill, Cos. Offaly and Westmeath; along with investigations at a crannog and burnt mound at Bofeenaun, Co. Mayo. In contrast to the above, the sites and survey dealt with in this paper have all been fully published (Moloney, Bermingham, Jennings, McDermott & O'Carroll, E.1995). In some respects, I see Annus Archaeologiae as a failed publication. This is a comment neither on the contributors nor on the editors. Simply put, this volume failed to connect with the wider audiences it was designed to communicate with. Thus, it did not reach as many other researchers and writers as it could have and should have. It did, however, reach some of the right people – Waddell in The Prehistoric Archaeology of Ireland references Halpin’s site at Newtown, Co. Meath, and Simpson’s excavations at Ballygalley, Co. Antrim (though, interestingly, he omits Newman’s account of Raffin, Co. Meath, preferring the 1993 interim report from the Excavations Bulletin). Obviously, it also reached and influenced the flint specialist that set me on this quest in the first place. Nonetheless, I cannot but believe that Annus Archaeologiae failed to get a ‘fair shake of the stick’. In my review of the 3rd edition of Waddell’s textbook, I remarked how books come and go and how, as time goes by, they retreat from being first-port-of-call research resources as newer research becomes available. 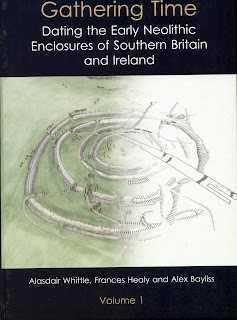 While some of the projects discussed here have produced their definitive publications (and they are to be much congratulated for doing so), the lack of final publications on Raffin Fort, Co. Meath, Ballygalley, Co. Antrim, and Newtown, Co. Meath, means that (after almost two decades) there is still much to recommend about this volume. In his Introduction to the volume, Mount describes the six papers as ‘snap shots of developing research at a particular period’. He sees this as one of the strengths of the volume, where interim statements are made quickly available to the profession so that they can begin to inform future debate at the earliest possible time. While not explicitly stated, I feel that there is an underlying assumption that these ‘snapshots’ are inherently disposable, once the major publications appear. The analogy with photography is, perhaps, unexpectedly apt as, with so many ‘snapshots’ they may end up becoming cherished items in their own right. They may a collection of snapshots, but they (or half of them, anyway) have yet to fade. Do yourself a favour – go and buy this rather excellent volume and help rescue a ‘lost’ gem! Anon. 1991 ‘In brief: two 'new' Neolithic houses’ Archaeology Ireland 5.4, 5. Cooney, G. & Mandal, S. 1998 The Irish Stone Axe Project. Monograph I. Bray. Gowen, M. & Halpin, E. 1992 ‘A Neolithic house at Newtown’ Archaeology Ireland 6.2, 25-27. Moloney, A., Bermingham, N., Jennings, D., McDermott, C. & O'Carroll, E.1995 Irish Archaeological Wetland Unit. Transactions: Volume 4. Blackwater survey & excavations. Artefact deterioration in peatlands. Lough More, Co. Mayo. Dublin. Newman, C., Dillon, M., Molloy, K. & O’Connell, M. 2008 ‘Environment and ritual in a Late Iron Age context: an example from Raffin, Co. Meath, Ireland’ in Fiorentino, G. & Magri, D. (eds.) Charcoals from the Past: Culture and Palaeoenvironmental Implications. Proceedings of the Third International Meeting of Arthracology, Cavallino-Lecce (Italy) June 28th – July 1st 2004. Oxford, 75-92. Simpson, D. 1990 ‘News: Neolithic settlement site at Ballygalley, Co. Antrim’ Archaeology Ireland 4.2, 43-44. Simpson, D. 1996 ‘The Ballygalley houses, Co. Antrim, Ireland’ in Darvill, T. & Thomas, J. (eds.) Neolithic houses in Northwest Europe and beyond. Oxford, 123-132. Simpson, D. D. A., Conway, M. G. & Moore, D. G. 1990 ‘The Neolithic site at Ballygalley, Co. Antrim. 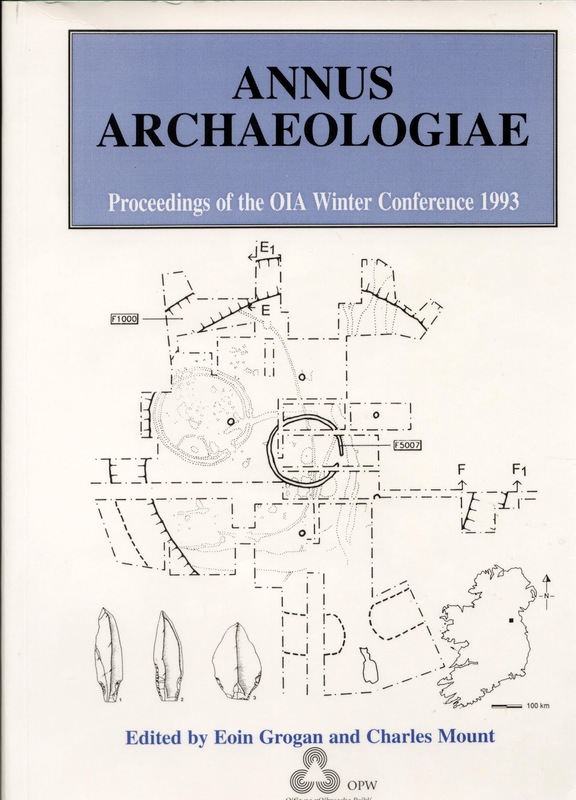 Excavations 1989, interim report’ Ulster Journal of Archaeology 53, 3rd Series, 40-49. Simpson, D. & Meighan, I. 1999 ‘Pitchstone - a new trading material in Neolithic Ireland’ Archaeology Ireland 13.2, 26-30. Woodman, P. C. 1977 ‘Recent excavations at Newferry, Co. Antrim’ Proceeding of the Prehistoric Society 43, 155-199. Woodman, P. C. & Johnson, G. 1996 ‘Excavations at Bay Farm 1, Carnlough, Co. Antrim, and the Study of the 'Larnian' Technology’ Proceedings of the Royal Irish Academy 96C, 137-235. Annus Archaeologiae is available directly from Dr. Charles Mount, 2 Carrig Glen, Calverstown, Kilkullen, Co. Kildare (Cmount@vodafone.ie) for €7.99 + P&P. Rates: €1.90 for Island of Ireland. €4.25 for UK and rest of the world. Payment by cheque, bank draft, or postal order. If you’re planning to do any shopping through Amazon, please go via the portal below. It costs you nothing, but it does generate a little bit of advertising revenue for this site – please help! Alasdair Whittle, Frances Healy, & Alex Bayliss. Oxbow books, Oxford, 2011. 2 Volumes, xxxviii+992pp. ISBN 978-1-84217-425-8. £45 (via Oxbow) or £50.07 (via Amazon). For anyone with an interest in Irish and British prehistory and, specifically how the chronologies are assembled through radiocarbon dating, the publication of Gathering Time: Dating the Early Neolithic Enclosures of southern Britain and Ireland has been long anticipated and much, much desired. It is hard to overstate the importance of this book and how it has already rewritten our understanding of Neolithic enclosures, but it also stands as a template for other intensive studies to follow and emulate. The central importance of this study is not simply that it uses a lot of new radiocarbon dates for various sites, but it is how this data is treated and processed on such a large scale that is already leading to new and exciting insights into prehistory. As many readers of this blog, both professional archaeologists and enthusiasts, will be aware, the advance of absolute chronologies in archaeology has, in large part, been due to the development of radiocarbon dating. 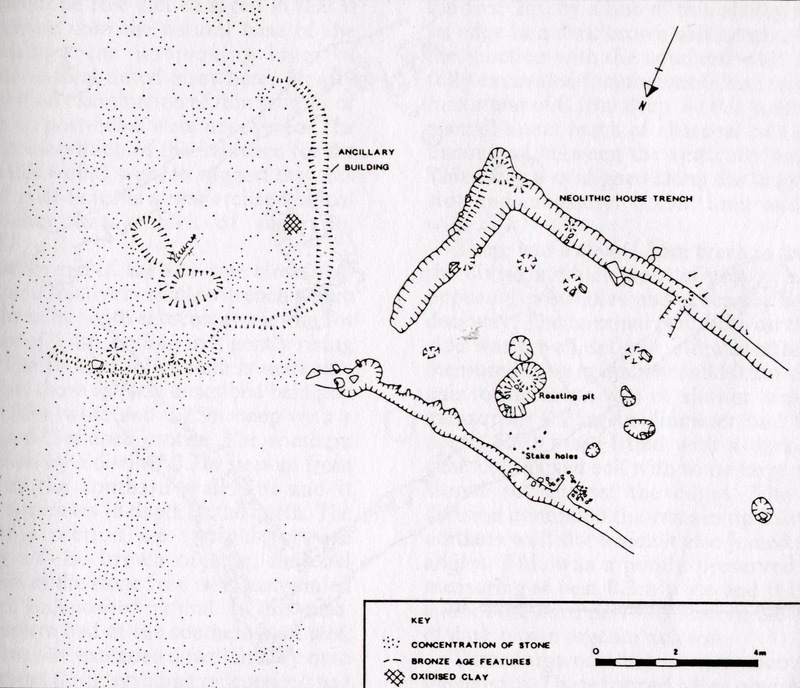 Prior to the seminal work carried out by Willard Libby and his team (James Arnold and Ernie Anderson), archaeological sites and were only datable through relative chronological means, such as seriation etc. In 1960 Libby, Arnold and Anderson won the Nobel Prize in chemistry for their work on radiocarbon dating. The basis of the method was that the measurement of the amount of the radioactive isotope carbon 14 (14C) surviving in a sample could be utilised to determine when, say, a piece of wood had been cut or grain harvested. These early dates relied on the assumption that the amount of 14C in the atmosphere had remained constant throughout history and, as the discipline was in its infancy, the associated standard deviations were also quite large. Over the years parallel advances in calibration of dates against tree ring curves, more sophisticated methods and machinery, along with increased care and refinement in the selection of materials and samples has led to better results. Today radiocarbon determinations have better accuracy and precision than ever before. Nonetheless, even with careful sample selection and the use of high-quality AMS dating, there is still the possibility that, when calibrated, the date will range over several decades to centuries. Since the 1990s a number of researchers have explored and developed a statistical system known as Bayesian modelling. The approach derives from the ideas of Thomas Bayes, an 18th century Presbyterian minister and mathematician. Simply put, this method allows the calculation of how the degree of belief in a given proposition changes due to additional evidence. In archaeological terms, the application of Bayesian modelling allows the refinement of radiocarbon dates through the addition of contextual information. Such information may include multiple dates for individual deposits, stratigraphic relationships, or even closely datable artefacts such as coins or pottery. To take an example from my own experience: at Gransha, Co Londonderry, I excavated a small pit group. A radiocarbon date from charcoal recovered from one of the features indicated that it had been deposited in the Early Neolithic period (4930±70 BP), but the date range was some 405 calibrated years (3943-3538 cal BC). As part of the INSTAR Cultivating Societies project at QUB additional radiocarbon dates were commissioned and then modelled by Rick Schulting and Paula Reimer (Chapple 2008, Appendix 7). The end result was that the potential lifespan of the site was reduced from 405 years to 0-50 years – a vast improvement on the earlier result from a single radiocarbon date. [Introductions to Bayesian modelling may be found here and here]. What Gathering Time set out to do was exactly like the example above, but on an enormous scale. Not only was the aim to produce robust chronologies for individual sites, but to then place them in wider chronologies and within their geographic and typological settings. The book presents 871 radiocarbon dates from nearly 40 causewayed enclosures. To assess how causewayed enclosures functioned as part of the wider Neolithic landscape and society models were also prepared for a range of monument types, including long cairns and long barrows. This brings the total analysed radiocarbon dates to a startling 2350. As such it is the largest Bayesian modelling project ever undertaken. The central findings of the project are that the main period of causewayed enclosure construction lasted from the late 38th century cal BC to the mid-to-late 36th century cal BC. Although a number of sites had an active life of several centuries, many were used for relatively shorter periods – some for only a matter of decades. When this data is incorporated into wider models, encompassing the entirety of the evidence, it is shown that the causewayed enclosures only appeared three centuries after the first Neolithic practices were established in southern Britain. The process of ‘Neolithisation’ is shown to have begun in south-eastern England and spread regionally over two centuries. Chapter 1, ‘Gathering time: causewayed enclosure and the early Neolithic of southern Britain and of Ireland’ (Whittle, Healy, & Bayliss) addresses questions of time and chronological resolution, along with a presentation of causewayed enclosures and the history of their research. Chapter 2, ‘Towards generational timescales: the quantitative interpretation of archaeological chronologies’ (Bayliss, van der Plicht, Bronk Ramsey, McCormac, Healy, & Whittle) provides an introduction to Bayesian modelling and the project methodology. In particular, it examines the necessary prerequisites for successful implementation of the Bayesian approach – from prior knowledge about sample data (taphonomy, association, stratigraphy etc.) to the tacit statistical assumptions involved in this form of model building. For the purposes of this project, southern Britain has been divided into what the authors describe as ‘pragmatically defined regions’. Chapters 3-11, each deal with the enclosures of a southern British region and place them in the context of contemporary Neolithic activity. In each of these chapters models are presented, along with a review of the broader implications of the new chronologies. In Chapter 3, ‘The north Wiltshire Downs’ (Whittle, Bayliss, & Healy) Windmill Hill, Knap Hill, and Rybury are examined. Chapter 4, ‘South Wessex’ (Healy, Bayliss, Whittle, Allen, Mercer, Rawlings, Sharples, & Thomas) looks at Hambledon Hill, Whitesheet Hill, Maiden Castle, and Robin Hood’s Ball. Chapter 5, ‘Sussex’ (Healy, Bayliss, & Whittle) presents Whitehawk Camp, Offham Hill, Combe Hill, The Trundle, Bury Hill, Court Hill, Barkhale, and Halnaker Hill. Chapter 6, ‘Eastern England’ (Healy, Bayliss, Whittle, Prior, French, Allen, Evans, Edmonds, Meadows, & Hey) is divided into five sub regions: The Chilterns (Maiden Bower); The Great Ouse catchment (Great Wilbraham, & Haddenham); The Nene Valley (Briar Hill); The Lower Welland Valley (Etton, Etton Woodgate, & Northborough); and East of the Fens. Chapter 7, ‘The Greater Thames estuary’ (Bayliss, Allen, Healy, Whittle, Germany, Griffiths, Hamilton, Higham, Meadows, Shand, Stevens, & Wysocki) presents Lodge Farm, St. Osyth, Orsett, The Essex side of the Thames estuary, Kingsborough 1 and 2, Chalk Hill, The Kent side of the Thames estuary, and The Thames Estuary and Beyond. Chapter 8, ‘The Thames Valley’ (Healy, Whittle, Bayliss, Hey, Robertson-Mackay, Allen, & Ford) presents Yeoveney Lodge Farm, Staines, Eton Wick, Gatehampton Farm, Goring, and Abingdon. Chapter 9, ‘The Cotswolds’ (Dixon, Whittle, Bayliss, Hey, & Darvill) examines Crickley Hill and Peak Camp. Chapter 10, ‘The south-west peninsula’ (Whittle, Bayliss, Healy, Mercer, Jones, & Todd) presents examinations of Membury, Hembury, Raddon Hill, Helman Tor, and Carn Brea. Chapter 11 (in volume 2), ‘The Marches, south Wales and the Isle of Man’ (Bayliss, Whittle, Healy, Ray, Dorling, Lewis, Darvill, Wainwright, & Wysocki) looks at the sites of Hill Croft Field, Beach Court Farm, Ewenny, Banc Du, and Billown. Chapter 12 ‘Ireland’ (Cooney, Bayliss, Healy, Whittle, Danaher, Cagney, Mallory, Smith, Kador, & O’Sullivan) deals in the same way as each of the above regions, but with the island of Ireland as a whole. The examination of dates from the Donegore Hill and Magheraboy causewayed enclosures, along with a host of associated determinations, allows the authors to argue that the Neolithic in Ireland began around 3800 cal BC. The general conclusion of these chapters is that there is no precedent for the majority of the elements that define the Early Neolithic in the preceding Mesolithic. These innovations include the domestication of animals, cereal cultivation, rectangular timber structures, bowl pottery etc. The authors conclude that these elements of Neolithic life first appear in the Greater Thames estuary during the 41st century cal BC. From there the process of Neolithisation spreads slowly into southern and eastern England, then west into Wales and the Marches by 3700 cal BC. The early dates from domesticated cattle bones at Ferriter’s Cove, Co. Kerry, have been taken to suggest that Neolithic migrants had unsuccessfully attempted to colonise Ireland, ahead of the later Thames estuary venture. The remarkably early dates from the Magheraboy, Co. Sligo, enclosure (40th to 39th centuries cal BC) are difficult to accommodate within the available models. Not only are they significantly earlier than the English examples, but they predate the emergence of other Neolithic practices on the island from the late 39th to early 38th centuries cal BC. Based on the totality of the evidence, it is argued that the Neolithic way of life was first introduced to Britain and Ireland from the near Continent. Similarities in bone and cereal assemblages suggest a number of possible points of origin, including: Brittany, Normandy, Calais, the Paris Basin, Flanders, and the southern Netherlands. One of the models advanced suggests that numerous small-scale migrations occurred from multiple departure points, over the course of 200-300 years. Another proposes a near-simultaneous, large-scale emigration from the Continent, while a third is a combination of the two with a small number of pioneers, followed by larger numbers over time. While the authors examine all of these scenarios in detail, their preferred explanation is of a relatively small ‘founder pool’ of migrants crossing from the Calais region into the Thames estuary and south-eastern England. Rather than a large-scale influx of people, the authors argue for rapid acculturation of the native population, especially from the 39th century cal BC; though they do allow for further waves of Continental migrants coming across the English Channel. Chapter 13, ‘Carbon and nitrogen stable isotope values of animals and humans from causewayed enclosures’ (Hamilton, & Hedges) was, essentially, a sub-project within the greater whole. The aims of this work were to document isotopic variation as thoroughly as possible; to measure the average range of human δ15N values from causewayed enclosures and compare them to the available data from chambered tombs; and to measure the differences in human and animal δ15N values. The authors conclude that results from the causewayed enclosures fit the emerging pattern for the whole of the Neolithic in southern Britain. Analysis of the animal remains indicated that the values for cattle, sheep, and pig differ consistently across all sites. In particular, pigs showed elevated δ13C values, which is interpreted as evidence for foddering in wildwood resources. Pigs also displayed slightly elevated δ15N values relative to cattle and sheep, but not of the order present in later assemblages. This is taken to suggest that a different management regime was in place during the Early Neolithic. Analysis of the human-faunal difference is interpreted as evidence for a high proportion of animal protein (either meat or dairy) in the diet. Chapter 14, ‘Neolithic narratives: British and Irish enclosures in their timescapes’ (Bayliss, Healy, Whittle, & Cooney) attempts to ‘weave narratives out of the chronological threads spun from the models constructed in the course of the regional discussions’. This is an extremely complex and involved chapter that, I am sure, will be the basis for discussion and debate for some time to come. The central conclusion of the chapter is that while ‘all models are wrong’ the intensive work on the Bayesian models and various alternative approaches, all showing similar results, may reassure us that the results are not ‘importantly wrong’. Even so, the authors make it explicit that the models presented here are not definitive, but are their preferred interpretations, based on the quality of the data available. Chapter 15, ‘Gathering time: the social dynamics of change’ (Whittle, Bayliss, & Healy) attempts to bring the evidence for the entire range of Early Neolithic life experiences together, moving beyond the enclosures to the transfer of artefacts and the husbandry and slaughter of livestock etc. In particular, the new chronological framework that the project has revealed allows a series of different timescales to be examined. These include the scales of generation, lifetime, active social memory, and longer-term structures like myth and story. Finally, the authors suggest that we are now at a point where the term ‘prehistory’ may be usefully abandoned. While terms such as ‘(pre)history’, and ‘protohistorie’ are rejected, alternative titles are proposed: ‘total history’, ‘absolute history’, and ‘total archaeology’. A final appendix, ‘Some unanswered research questions for southern British enclosures’ (Healy, Whittle, & Bayliss) give a succinct list of questions, the answers to which would greatly add to our understanding of the individual sites mentioned, and aid in further refining the author’s models. 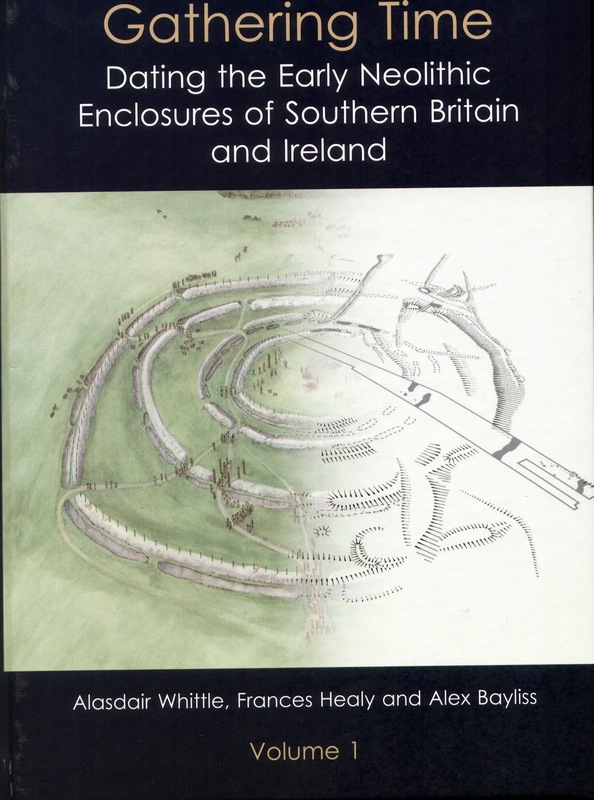 The debate as to the function of causewayed enclosures has been around for some time and the authors examine the possibilities, from places of assembly to defuse tensions between rival groups keen to exploit the same limited resources, to places of political and dynastic ritual where access was granted only to a privileged few. However, no amount of dates and chronological refinements can elucidate the meanings that these sites had to their creators and those who witnessed and partook in the ceremonies carried out there. Nonetheless, analysis of the dates does suggest that they were constructed in three defined phases from an experimental start where a range of shapes and sizes of enclosures were attempted. This was followed by a rapid expansion of the numbers of enclosures being constructed, increasingly to a common template. Finally, small communities built their own enclosures to express their own independent identities. The authors admit that the precision with which we may now examine the commencement of the causewayed enclosure phenomenon is not replicated in how we understand their demise. They appear to have been abandoned, but not wholly forgotten. They frequently survived in the landscape, sometimes reused and with their ditches recut. As I said at the beginning, the importance of this work is not simply that it has forced a large-scale rewriting of the process of Neolithisation and presented us with a fine-grained chronology of the period, but that it now serves as a template for other researchers to follow. Whether they study other geographical areas or different time periods, Gathering Time now shows the way forward to us all. Notes: 1) Robert M Chapple wishes to acknowledge the financial assistance provided under the Built Heritage element of the Environment Fund by the Department of Arts, Heritage and the Gaeltacht towards the Irish Radiocarbon & Dendrochronological Dates project [IR&DD Facebook Page]. 2) I am indebted to Christopher Catling’s (2011) review of Gathering Time for helping me make sense of this vast amount of data. Catling, C. 2011 ‘Gathering Time: The Second Radiocarbon Revolution’ Current Archaeology 259, 12-19. 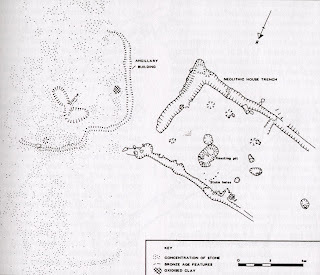 Chapple, R. M. 2008 ‘The excavation of Early Neolithic and Early Bronze Age sites at Oakgrove, Gransha, county Londonderry’ Ulster Journal of Archaeology (3rd Series) 67, 22-59.